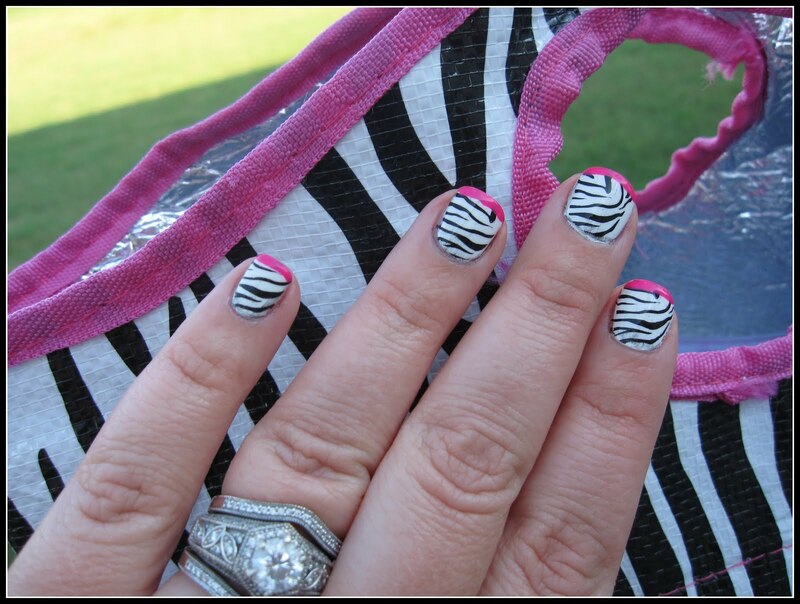 For FBFF today, we're linking up to Miss Rockwell at Lifestyles of the Thrifty and Shameless with our Creative Manicures posts. I LOVE this. No, seriously. I LOVE THIS!!! I love doing my nails, and had fun with this idea! Head on over to her page to see a list of everyone who is posting. I'm really looking forward to seeing the other girls, there are some REALLY creative people out there. Enough, I know. Get to the mani. And I knew I had my creative mani. 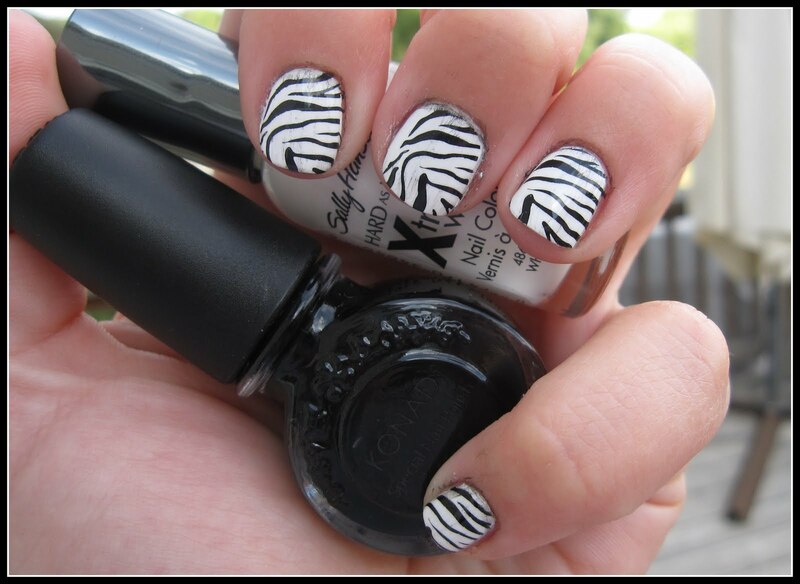 So, to achieve this, I painted 2 coats of Sally Hansen XW and let it completely dry. (That is after shaping, dealing with cuticles and Nail Magic basecoat.) After it had dried, I wiped an alcohol wipe over the nails to make sure they were clean and went to work. I used the Konad system I bought on Amazon, with Konad special polish in black. I had already tried a black polish of my own, Milani, but it's not strong enough. I think Konad special polish is the equivalent of 3 coats? I think I read that somewhere. I have since learned that the special nail polish takes longer than regular polish to dry, hence the swipes...oops! I later used China Glaze Purple Panic for the tips, applying them freehand. I finished off with a coat of Seche Vite topcoat. Stamping is incredible. Here's a video, the video I first watched. It looks complicated, but trust me, it's not. You get into the swing of it really fast. I bought a little manicure cup-thing from Sally Beauty like they use in nail salons for the nail polish remover. I HIGHLY recommend stamping. Then again, it's addicting! i love this, gonna go check out where to purchase this! Awesome! You totally rocked this manicure out girl!! OMG I was going to say you did that by hand - incredible! hehe I'm wearing a zebra print currently thanks to Sally Hansen nail stickers :) Love this week's FBFF idea! Your nails look fantastic! 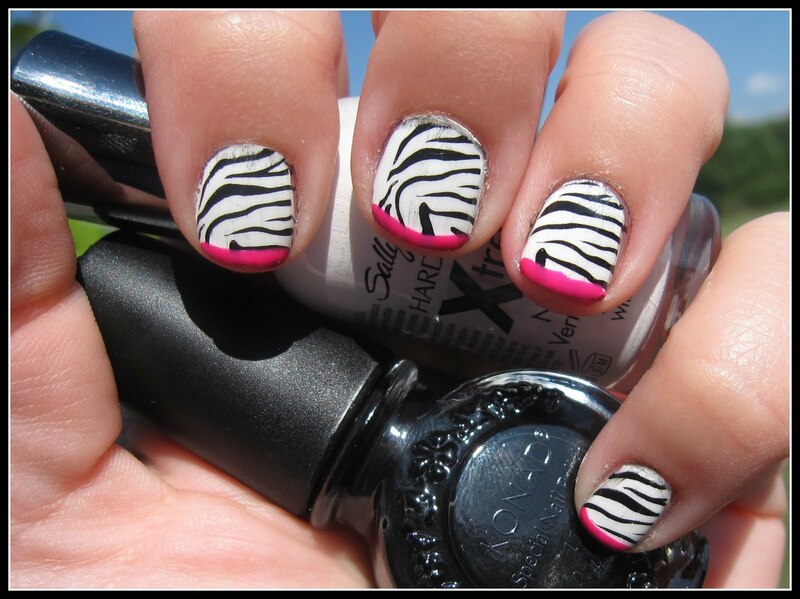 Zebra with hot pink is such a sassy combo and I love it on nails! (ps. your wedding ring is beautiful!) I just discovered your blog through the FFBF...so cute, love the chandeliers! Super cute! It looks amazing, and to think you did it yourself. I want to try it for sure! I also have a Konad stamper! 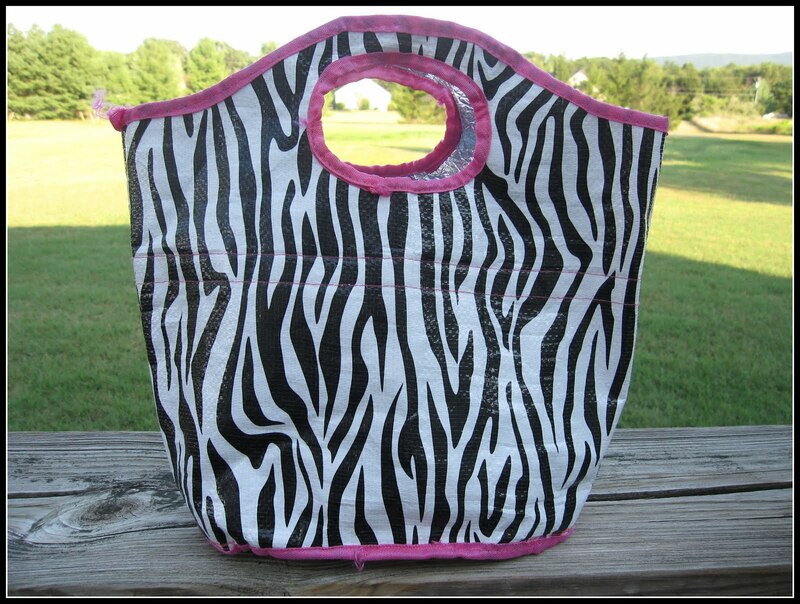 Zebra print was the first one I did too. :) I love that you added that little touch of pink! OMFG I love this. It's insane. I wish I had a Konad, maybe I'll get the polish markers and try to freehand it? Great job darling! Visiting from FBFF. This is so pretty and intricate. Love it. Okay...so I'm definitely investing in a Konad stamper ASAP. I'm literally drooling over here! It's gorgeous and I love the way you added a pop of color on the tips! Thanks guys! I definitely recommend the Konad! It's sooooo fun! !